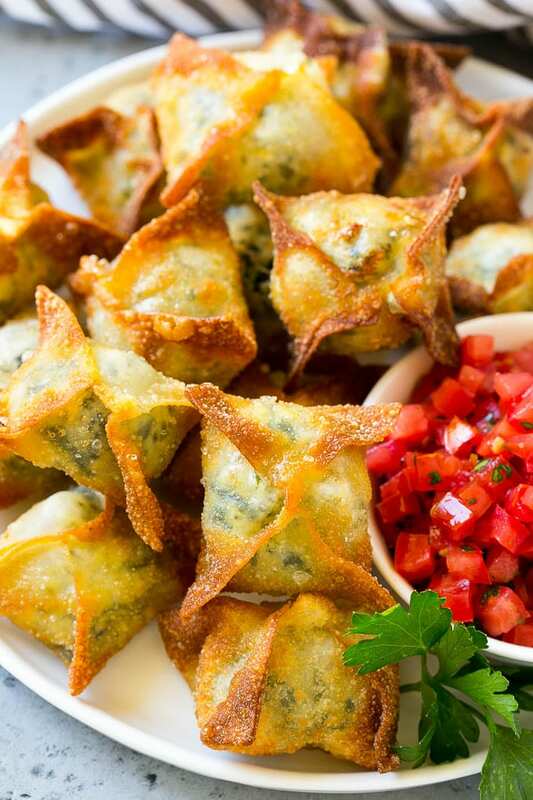 These spinach artichoke wontons are filled with a mixture of cream cheese, artichokes, spinach and grated cheese, then wrapped up and deep fried to golden brown perfection. 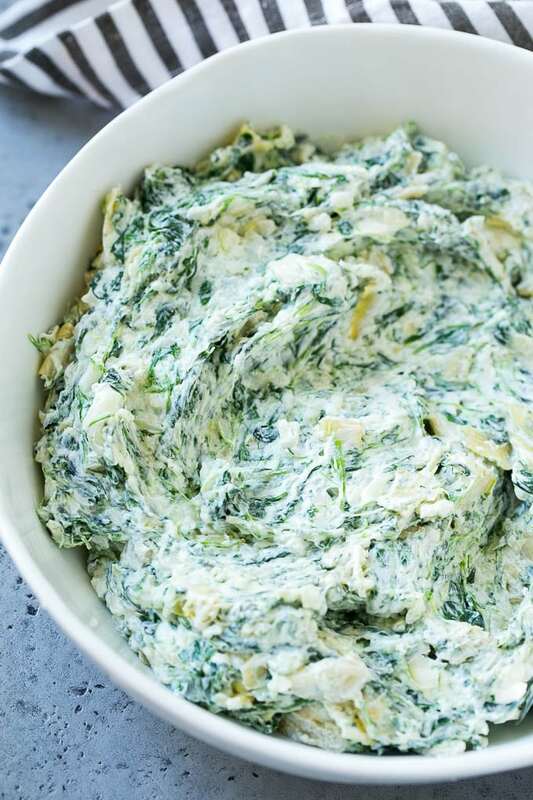 An unexpected party appetizer that’s a unique take on the traditional spinach artichoke dip. 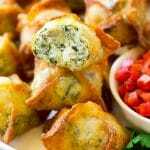 I love a good spinach artichoke dip, and when you take that creamy and delicious dip and add it to fried wontons, you get appetizer perfection. Have you ever found the magical combination of two different appetizers fused into one? These spinach artichoke wontons are the perfect mash up of two popular snacks made into one ultimate appetizer. This snack will definitely be a hit at your next party! 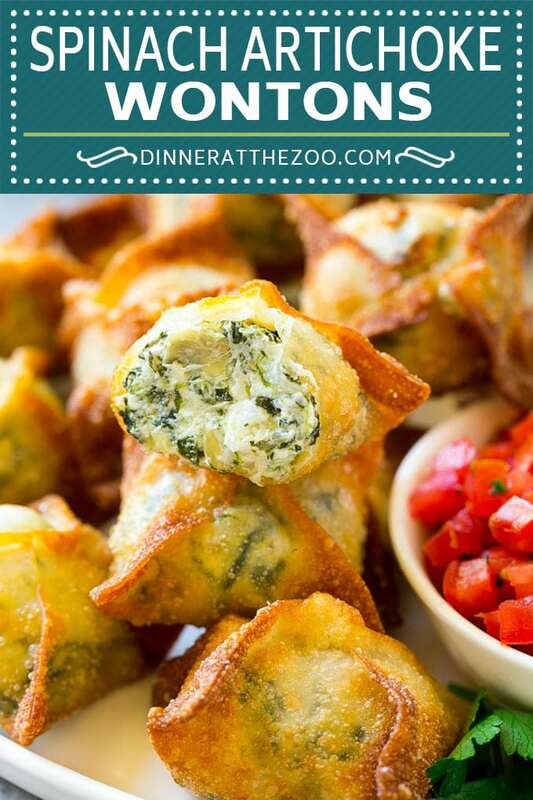 HOW DO YOU MAKE SPINACH ARTICHOKE WONTONS? 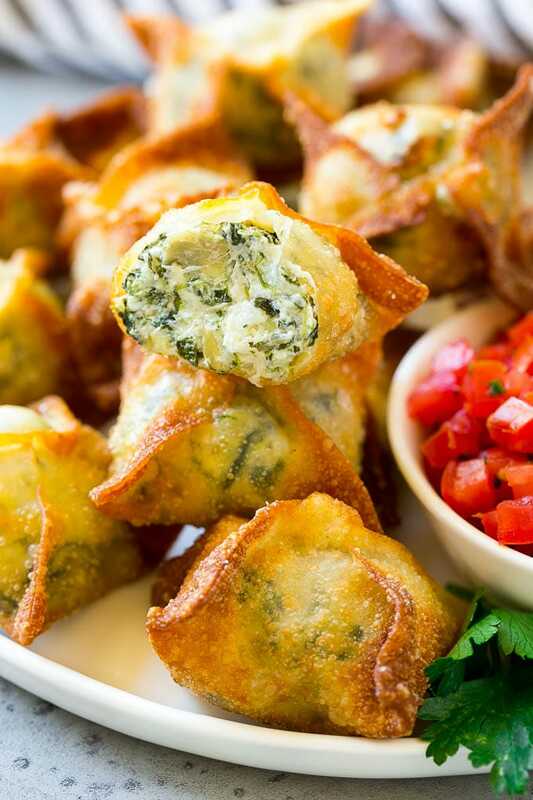 These wontons are filled with a mixture of cream cheese, artichokes, spinach, parmesan and mozzarella cheese. They’re then wrapped up into little packets and deep fried until golden brown. It’s really that simple! 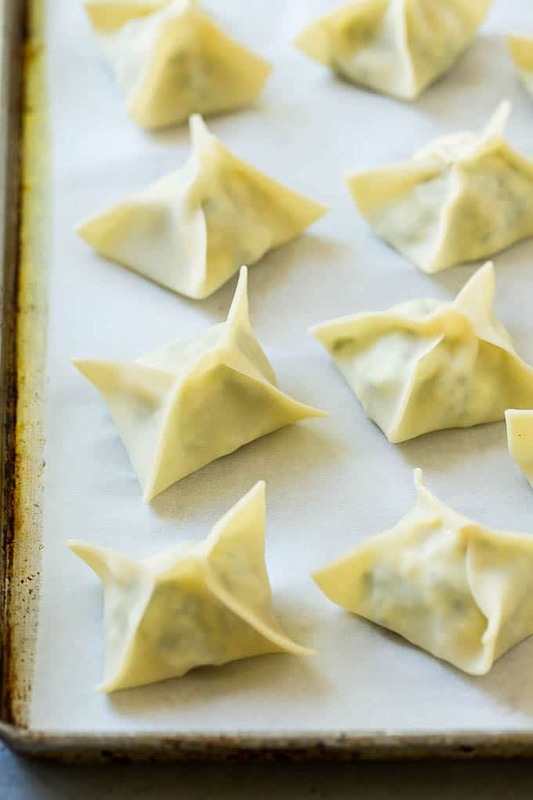 If need be, these spinach artichoke wontons can be prepared up to 4 hours in advance and stored in the fridge until they’re ready to be fried. Serve your wontons as is, or with a mixture of finely diced tomatoes and herbs which can be served on the side as a bruschetta style dip, or spooned over the wontons. The tomatoes add a freshness that compliments the richness of the wontons. Folding wontons can be a bit tricky if you’ve never done it before. No worries, it’s truly not hard, but it’s nice to know the correct way of folding them in order to get a nice presentation for of your appetizer. For directions on how to properly fold a wonton, click HERE. The little squares of dough used to hold the spinach and artichoke mixture are called wonton wrappers. These are made out of egg, salt, flour, and water. This is a very basic dough that’s popularly used in Asian dishes. You can purchase pre-made wonton wrappers in the produce section of most grocery stores. CAN WONTONS BE BAKED INSTEAD OF FRIED? Wontons can be baked if desired. However, they usually do not turn out the same even, golden brown consistency as frying would offer. Bake at 400 degrees for approximately ten minutes or until the wontons are golden brown. I was pretty pleased with this fun snack – there’s nothing better than a good artichoke dip, but when you wrap it in a crispy wonton, it gets even better! I get tons of compliments every time I make these little guys, and you will too! These spinach artichoke wontons are filled with a mixture of cream cheese, artichokes, spinach and grated cheese, then wrapped up and deep fried to golden brown perfection. An unexpected party appetizer that's a unique take on the traditional spinach artichoke dip. 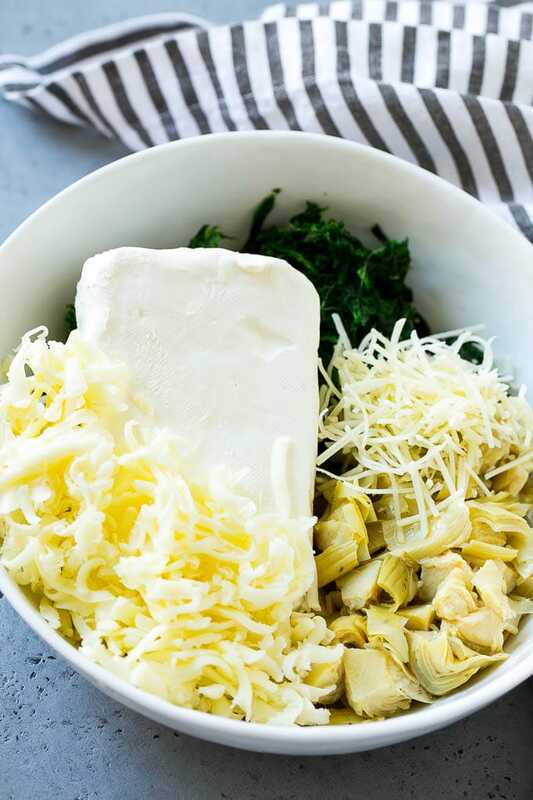 Place the cream cheese, spinach, artichoke hearts, mozzarella cheese, parmesan cheese, salt and pepper in a bowl. Still until well blended. Place a wonton wrapper on a flat surface and drop 1 1/2 teaspoons of the cream cheese mixture into the center. Brush the edges of the wonton with the egg. Bring 2 opposite corners together in the middle of the wonton and pinch. Repeat with the other 2 corners and pinch to form a package shape. Repeat with the remaining wontons and cream cheese until all are filled. Heat 4 inches of oil in a deep pan to 350 degrees F.
Fry 5-6 wontons at a time, turning them as needed to make sure they brown evenly. This process should take about 3-5 minutes. Drain the cooked wontons on paper towels and repeat the frying process with remaining wontons. In a small bowl, combine the tomatoes, parsley with a pinch of salt. Serve the wontons immediately, with the tomato mixture spooned over the top or served on the side. I’ve made them a few times now and they are so good! Yes that would work just fine! These look absolutely amazing! Something I would really love to make for my holiday party! Do you think these could be made in advance? You can fold up the wontons in advance, but they’re best when fried just before serving. You could try frying them in advance and reheating them in the oven until crisp, I just haven’t personally done that! These look so good! I love anything with artichokes!